At last, a shampoo pure enough to ordain your mane, consecrate your crew, and bless your hair with botanical wisdom. 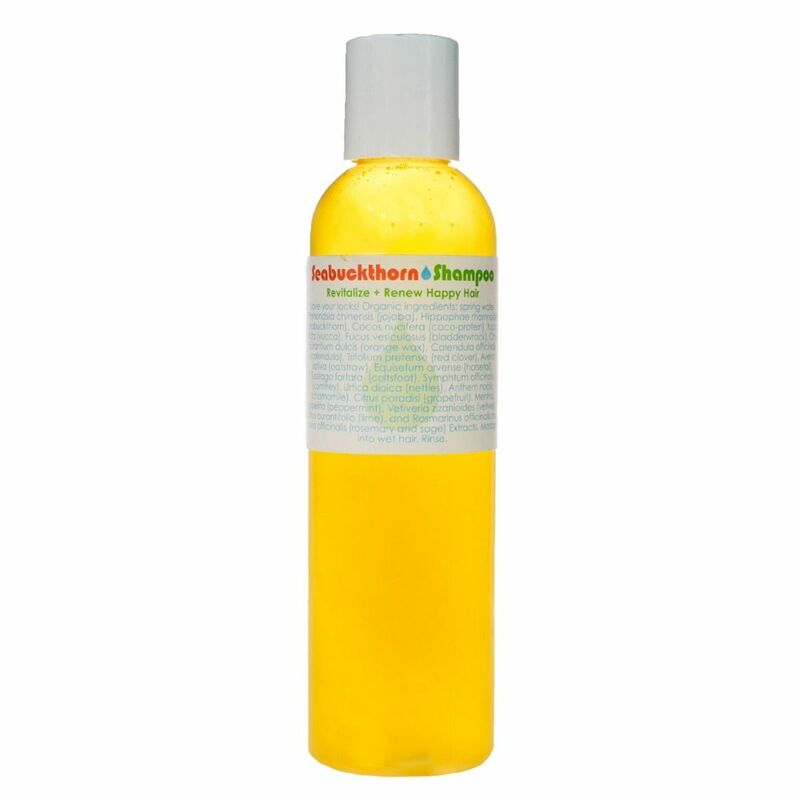 Living Libations Seabuckthorn Shampoo brings out the best in all hair types without the chemical suds! Filled with a bounty of nature’s essences and herbs, our shampoo will nourish and harmonize your hair without weighing down your mane. Indulge in a cascade of botanical delights showering upon your lovely locks. Undress your tresses from chemical duress with tried and true herbal infusions that benefit all hair types. Seabuckthorn Shampoo will glorify your luscious locks and is beautiful for babies, children, as a bubble bath, and body wash too. This shampoo is so pure that it may be diluted to use as a body wash, and many people find that they can wash their hair less often with this shampoo. The mild sudsing of this shampoo comes from the combination of coco-protein and yucca root. Coco-protein is derived from the sugars, proteins and fatty acids of organic, virgin coconut oil. Yucca root is very high in saponins, the soap making ingredient, which causes the lather in our shampoo. This special root also has emollient properties, which have a soothing effect on the hair shaft. This shampoo will invite your hair to shine and your heart to sing in the shower. Hair-loving herbs are intelligently infused in wholesome jojoba oil and swirled together with aromatic plant essences to create a functional work of art that gently lifts away the day’s dirt without stripping the hair’s oils or drying the scalp. Each batch of Seabuckthorn Shampoo is carefully crafted in small batches ensuring that your tresses receive the best, drenching your mane in a soothing, silky supplication. Our shampoos are great for colored hair. Healthy looking hair sets the stage for dimensional color and shiny strands. The day or night before you plan on applying color, use our super hydrating, heavenly Honey Myrtle Hair Conditioning Mask, or sleep with Shine On or True Blue Spirulina Conditioners in your hair overnight. This will prime hair and pave the way for luminous color afterward. Plump strands of hair grab on to the dye and hold color longer without fading. A few days after coloring your hair you may want to skip all hair products to give the dye ample time to set. Massage a small amount into wet hair, adding water as necessary to create lather. Rinse and follow with Shine On Hair Conditioner. May be diluted further to use as a body Wash or a bubble bath. This shampoo is perfectly safe for young ones, and color-treated tresses. Spring Water, Simmondsia chinensis (Jojoba) Oil, Hippophae rhamnoides (Seabuckthorn Berry), Cocos nucifera (Coco-Protein), Yucca elata (Yucca), Fucus vesiculosus (Bladderwrack Seaweed), Citrus aurantium dulcis (Orange Wax), Calendula officinalis (Calendula), Trifolium pretense (Red Clover), Avena sativa (Oatstraw), Equisetum arvense (Horsetail), Tussilago farfara (Coltsfoot), Symphtum officinalis (Comfrey), Urtica dioica (Stinging Nettles), Anthem noblis (Chamomile), Citrus paradisi (Grapefruit), Mentha piperita (Peppermint), Vetiveria zizanioides (Vetiver), Citrus aurantifolia (Lime), and Rosmarinus officinalis and Salvia officinalis (Rosemary and Sage) CO2 Extracts. Seabuckthorn (Hippophae rhamnoides) Essential Oil – The Latin name of the berry producing Seabuckthorn bush means “tree that makes the horses shine” referring to the berries benefits of making horses have shiny hair. Our seabuckthorn berry oil is a super-critical extract that has an affinity for strong, shiny, lustrous locks. Coco-Protein (Cocos nucifera) – Coco-protein along with yucca are the saponifiers that help our Seabuckthorn Shampoo have its purely natural, botanical suds. Coco-protein is derived from the sugars, proteins and fatty acids of organic, virgin coconut oil. Coco-protein is a non-ionic saponifier that has been tested to be free of any recognized side effects. It is not detected in human tissue or urine and is free from ethylene oxide (which can cause nitrosamine contamination) and also free from preservatives. It has excellent dermatological compatibility and also has low environmental impact, as it is highly biodegradable. Coco-protein is not related to any of the sulfates or sulfides, which are best avoided. Yucca (Yucca elata) – Yucca, also known as soap tree, is a native plant to the America Southwest. The roots of these trees are very high in saponins and traditionally have been used by Native Americans as a natural body and laundry soap. These yucca root saponins are a soap-making ingredient, which encourages the lather in our shampoo. This special root also has emollient properties that have a soothing effect on the hair shaft. Bladderwrack Seaweed (Fucus vesiculosus) – This succulent seaweed is naturally mucilangenic, being both moisturizing and tonifying for the hair. People from regions that ingest lots of seaweed have thick, beautiful hair! Bladderwrack serves the roots and shaft of the hair. 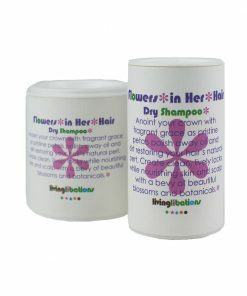 It holds moisture in the hair strands to reduce fly-aways and frizz. Orange Wax (Citrus aurantium) – This winsome wax is extracted from the pressed peels of oranges and contains fabulous phytosterols. It creates a natural emulsifier that enhances the stability of the crème and entwines the ingredients together. Calendula (Calendula officinalis) Herbal Infusion – Our calendula infusion reveals sunny bright yellow petals packed with positive, potent properties. 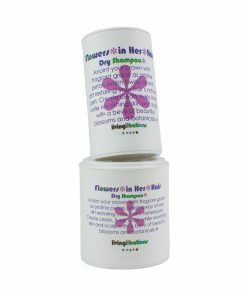 This infusion harnesses the pleasant properties of marigold petals that comfort and caress dry scalps. Red Clover (Trifolium pretense) Herbal Infusion – Red clover is quite commonly known for its sweet pinkish-purple blossoms popping on the hillsides. Botanically red clover adds bounce to hair strands. Oatstraw (Avena sativa) Herbal Infusion – Oatstraw gives more body and fullness to tresses, and smoothes out knots and tangles. Oatstraw is gluten free. Horsetail (Equisetum arvense) Herbal Infusion – Horsetail helps build strong, long ponytails! 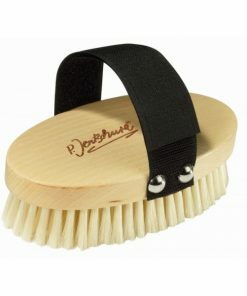 It tones the hair, adds residency, and limits breakage, such as split ends. Coltsfoot (Tussilago farfara) Herbal Infusion – Cheery coltsfoot is one of the first flowers to bloom in spring bringing its sunny yellow cheer to welcome the new season. Like nettles and horsetail, coltsfoot also supports healthy-looking, shiny hair. It also balances sebum production and improves sheen and elasticity. Stinging Nettles (Urtica dioica) Herbal Infusion – Stinging nettles fortifies hair fibers for strength. Chamomile (Anthemis nobilis) Herbal Infusion – Chamomile is a well-loved and soothing herbal that eases the appearance of dry, dandruff flakes and conditions the hair beautifully. Grapefruit (Citrus paradisi) Essential Oil – Gladdening grapefruit is a cheery oil that is uplifting and euphoric. 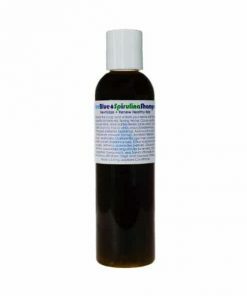 It cleanses and clarifies the hair and scalp. Peppermint (Mentha piperita) Essential Oil – Perky peppermint clears the mind and brings its cache of cooling botanicalbiotic compounds to care for dry scalps. 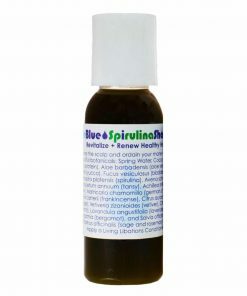 It wakes up the scalp to balance sebum production and leave the hair shiny and soft. Vetiver (Vetivera zizanoides) Essential Oil – Vetiver is a rooted, earthy, and grounding essence with a deep, mysterious fragrance. It is distilled from the root of a tropical grass and has an affinity for hair and skin care. Vetiver moisturizes and strengthens the hair shaft. It also gives hair a glossy glow. Lime (Citrus aurantifolia) Essential Oil – Lime’s fresh, citrusy scent supports shiny, happy hair. 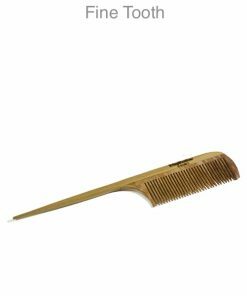 It helps to clean the hair by releasing trapped dirt and oils and thus renewing the hair’s natural luster. Sage + Rosemary (Salvia officinalis + Rosmarinus officinalis) Extracts – These potent and pure nectars contain hundreds of plant bio-actives and antioxidants that extends the life of this crème by slowing the oxidation process. It brims with cogent compounds that serve hair strands and scalp. I want to say a big thank you for your hair care products. I’ve struggled with thin, life-less hair for most of my life. My hair has a hard time looking/feeling bouncy & voluminous – but when I use the seabuckthorn shampoo…I feel like a new person! I’ve ALWAYS struggled finding good natural hair care products. Most natural hair care products either dry out my hair or don’t wash it properly. A lot of them make my scalp terribly itchy and make my hair look dull and fried. For the longest time I’ve wanted to try Living Libations hair care products, but based on my bad experiences with most natural hair care products, I was reluctant. I’m happy I finally did give it a go because I was really happy with the results. The Seabuckthorn Shampoo cleans my hair really well, leaves no residue, no itchy scalp, and it lathers really well for a natural shampoo. I also like the light herbal scent and that I don’t need much of it to thoroughly wash my hair. All of this is a plus! I was a user of the most expensive hair products I could find to give life to my thin, fine, and greasy scalped hair. 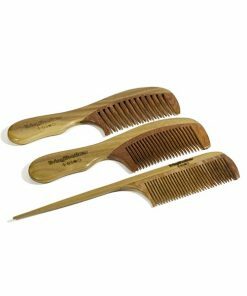 The only one I ever found made my head itch like crazy and I used it for years despite my itchy scalp. During that time my hair became thinner, greasier and pretty much stopped growing. My hair salon carries all the expensive stuff and when I was in after 8 weeks of using the shampoo my hair dresser looked at me in disbelief and asked me what I was doing because my hair had grown so much in 8 weeks AND new hair was growing in. Using Seabuckthorn shampoo has changed my hair completely. It took me a good 2-3 weeks to adjust to it, as my hair was only used to chemicals but the itch stopped immediately and I will NEVER use those toxic products anymore as it was what was preventing my hair from growing in the first place! I do wash it every day during the week as my hair is still too thin and oily not to, however weekends are now hair wash free and with the Flowers in Her Hair Dry Shampoo and Hair and Scalp Tonic – I’m a new woman! Can’t wait to see my hair a year from now. I bought a 1000 ml bottle of this over two years ago. I invested in it after trying the trial size. I had experimented with shampoo bars and had inconsistent results, mostly to do with having hard water, and was fed up with having bad hair days. I never have a bad hair day after I use this shampoo. My hair is shiny and silky. As someone with sensitive skin and a sensitive nose, the ingredients in this are perfect. I’ve noticed in the past that certain shampoos make the patch of eczema on my chest red and flaky but I have no issue with this. I read a review where someone said they used the seabuckthorn conditioner as a lotion and I think I will try that as soon as I get another bottle of conditioner. I decant from the large bottle as needed into one of the trial size bottles and I’m about halfway through it. It has a beautiful golden color that makes me happy whenever I see it. I tend to experiment with new products, but I have yet to find any natural shampoo that makes my hair as shiny and clean as Seabuckthorn shampoo. It’s something that I keep coming back to, for many reasons. The first being that I love the scent, I notice mostly mint and citrus. And I love how it lathers. To use, I double wash my scalp and condition my ends (with the matching conditioner which smells even better, and the scent lasts in my hair at least 24 hours, sometimes longer.) The result is shiny hair that moves, rather than clinging together. It’s hard to believe that I can get such a lustrous result with only shampoo and conditioner rather than a bunch of products. Having products like this that work reliably is such a blessing. A good hair day really is a confidence booster. I also wanted to note that despite having it for such a long time, it’s still just as effective. It’s a gentle cleanser that makes a tingling sensation on the scalp. I’ve even used it as a facial cleanser and the tingly sensation is nice but not too much for sensitive skin. The only improvement I can imagine is if it was offered in a rose formulation – I imagine it would be a gorgeous red like the RoseGlow Serum. I would buy it in a heartbeat! “How do I even begin to explain my heartfelt thanks to you for your loving creations. About 2 years ago I first discovered your creations to help transition into a natural and vibrant way of being. It encourage me to play around and make my own little creations and so I stopped buying your products. But alas, my creations can not compare to the wizardy of your concotions of bliss. So I have returned to turning my abode into a love affair with your creations. Within the first day of using them, my mood has lifted, my skin feels soft and luminous and my hair is almost like when I was a child. It has been really damaged over the years from colour, drying, dreadlocks, you name it. I have tried so many natural shampoos over time and they have always been meh… not impressed. This seabuckthorn shampoo has healed my dry, itchy scalp in 3 washes. WHAT?? I love it with the shine on conditioner, my hair is silk after.